Working as a team, Mona and Shari Wiener provide a high level of detailed service to their buyer and seller clients. A longtime member of the Newton/Brookline community and a consistently top-producing agent, Mona Wiener takes great pride in knowing that much of her real estate brokerage is the result of working with people who have bought and sold with her in the past. Since entering real estate in 1983, she has built a reputation as a leading agent who, with a sense of humor and a straightforward manner, has earned the respect of her peers and her clients. Currently, Mona resides in South Brookline with her husband, Martin. Her two daughters attended Baker School and thereafter Brookline High School. She knows the town and its real estate market very well, and she is a great resource for her buyers and sellers. 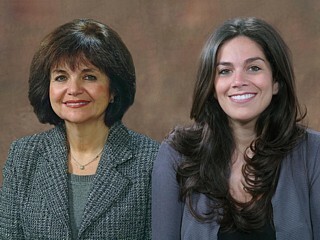 Shari Wiener is a lifelong Brookline resident who has expanded her real estate practice by joining with a thirty-year veteran of the industry and her mother, Mona Wiener. Shari attended the Baker School and Brookline High School, and she is a Syracuse University graduate. An active member of the Young Leadership Division of Combined Jewish Philanthropies, Shari resides in Needham with her husband.